A heavy-duty truck that combines first-class fuel efficiency with durability. An evolution in Japanese innovation that provides smarter solutions to today's transport challenges. New Quester, a smart move for your business. New Quester’s flexibility makes it suitable across a variety of applications and segments such as general cargo, long haul, construction and waste management. And now ESCOT’s added power and performance in New Quester means that these and many other assignments can be carried out with increased fuel and driver efficiency. Driver shortage has been an issue in the trucking industry for several years. Attracting and retaining driving talent is a tough task. New Quester features a spacious cab with a more pleasant and comfortable working environment. And with ESCOT onboard, a more efficient drive is the result. 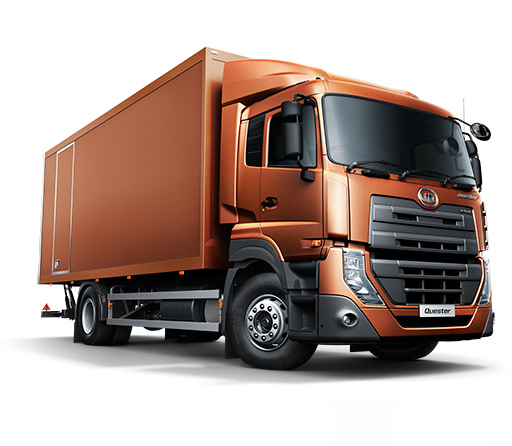 New Quester is a truck your drivers will be proud of. With more trucks on the road and drivers far from home base, just one minor accident can throw operations off course and delay important deliveries. Safe driving starts with the driver. A number of features including reliable auxiliary braking system and hydraulic retarder make New Quester a wise investment for safer operations. Complex, multi-layered interfaces and login procedures can make it difficult to access the detailed information when you need to make quick, positive decisions to choose the most efficient routes and maximize truck uptime. UD Telematics services will help you improve your profitability by maximizing vehicle uptime and fuel efficiency, while reducing unplanned stops and operational costs. Maximizing your resources equates to ensuring productivity and efficiency on every transport assignment. Every truck in your fleet should operate at its capacity. New Quester offers you more payload and productivity possibilities than ever. The optimized tare weight and driveline have significantly reduced the truck’s weight, allowing you to transport more on every trip.